What a great Saints Night In! Saints Night In saw public health and wellbeing partners come together at the Totally Wicked Stadium to promote men’s health and wellbeing. 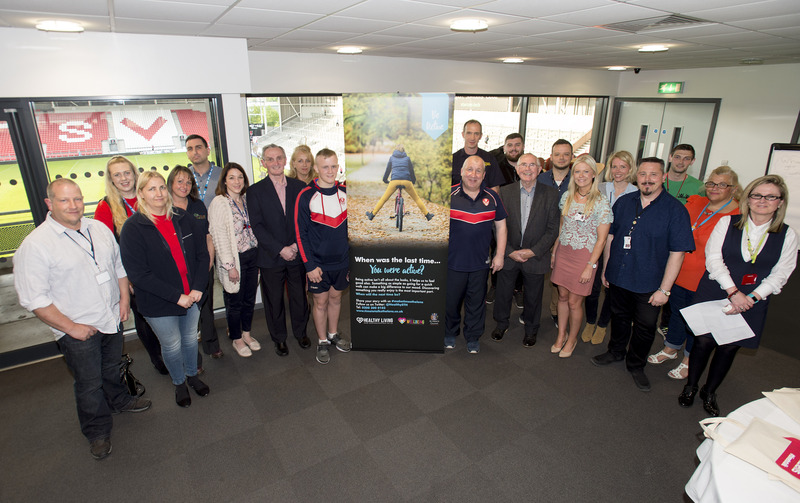 Saints Community Development Foundation, alongside St Helens Public Health and partners, hosted a ‘Saints Night In’ event to promote men’s health and wellbeing. The event, held at the Totally Wicked Stadium on 3 May, saw past players Geoff Pimblett and Peter Harvey, and present players Matty Smith and Tommy Lee, give talks about their time at the club and showed footage of their most memorable games. There was also an opportunity for attendees to ask them questions. Partners included St Helens Council’s Healthy Living, Adult and Community Learning, Public Health, Sports Development, Arts and Ways to Work Teams; St Helens Integrated Recovery Service; Smokefree St Helens; The Mersey Forest; NHS St Helens Clinical Commissioning Group; Veterans Support; Mindsmatter; St Helens Mind; Liverpool John Moores University; Merseyside Fire and Rescue Service, and Bridgewater Community Healthcare. Partners were on hand to provide information and advice about the services they offer including help to quit smoking, mental health and wellbeing support, creative and learning workshops, help to get into employment, drug and alcohol support, having a say on local health services, using green spaces and getting active to boost wellbeing and support for veterans. There were also prizes to be won, with a raffle for GO Outdoors vouchers. Those who attended have been invited back to the stadium for a tour and a health check provided by Health Trainers from the Healthy Living Team. The health check includes measurements such as blood pressure, height, weight, BMI, cholesterol and a diabetes test and advice is given based on results.